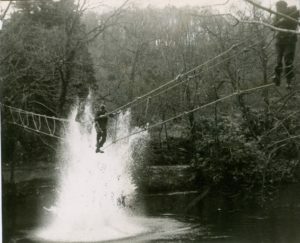 Lochaber is famous for its link to the Commandos and other special forces which trained in the area during the Second World War and much of that time saw live ammunition being used. One result of this and the use of other live ordnance such as grenades and explosives was that a forest fire raged across the hillside at Loch Arkaig in 1942. Wartime commando training in the forest around Loch Arkaig. 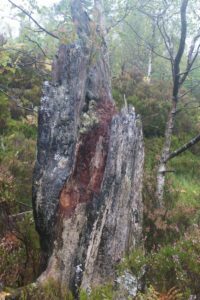 Now scientists surveying Loch Arkaig pine forest, near Spean Bridge, have discovered rare ‘fire’ lichen growing on the stumps of some of those trees destroyed by the flames. Fire lichen on a burned tree. Photograph: Andy Acton. 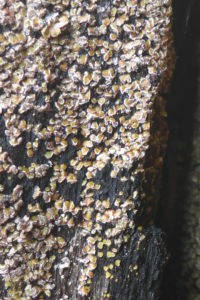 The Carbonicola anthracophila lichen only grows on charred conifer trees and has been recorded at just three other locations in the UK – Glen Affric, Glen Quoich and Glen Strathfarrar. 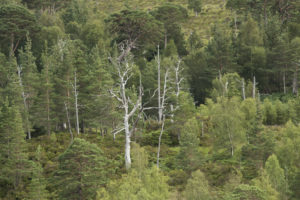 British Commandos and Allied Special Forces, including the Free French trained at Loch Arkaig during the war and the fires saw Scots pines cooked in their own resin. 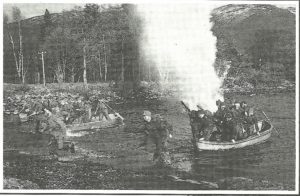 The loch was also used for live fire training, as seen from the explosion behind this group of commandos. They were preserved, still standing like ghost trees across the hillside and now, 75 years on, the ‘fire’ lichen is a living legacy of that blaze. 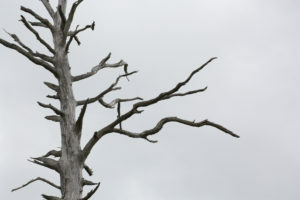 Two of the dead pines destroyed during the war. Photograph: John Macpherson/WTML. Another of the burned trees. Photograph: John Macpherson/WTML. The lichen survey was commissioned from experts Andy Acton and Brian Coppins to help inform long-term conservation management at the site. The four-day survey found around 150 different species. In their report, the two experts said they had only scratched the surface of what the forest might hold. The Carbonicola anthracophila was found on just two tree stumps and Mr Acton said it was the first time he had seen this particular species so it was particularly exciting. ‘But Brian referred to it as a “mega tick”, so he was clearly excited too. Brian found it first, then the hunt was on for more, and I went on to find it on another stump,’ Mr Acton explained. 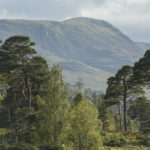 Woodland Trust Scotland has partnered with Arkaig Community Forest – a local community-based charity, which shares the ambitious, far reaching and long-term goals for the 1,027-hectare site. Together the two organisations intend to carefully and sensitively restore native woodland habitats across the entire forest and demonstrate the ecological, social and economic value of ancient woodland restoration. The aim is also to support the remote community living around the forest to benefit from active sustainable forest management activities such as woodfuel production, eco-tourism and adding value to timber. The forest is home to wild boar, sea eagles, golden eagles, ospreys, pine martens and deer, among many other species. 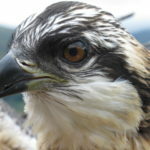 A live osprey nest camera supported by players of People’s Postcode Lottery currently streams online the antics of resident pair Louis and Aila. 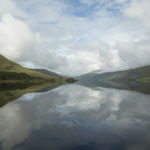 Loch Arkaig is not just famous, however, for its wild and remote beauty. It was the location for a sequence in the smash hit movie Harry Potter and the Deathly Hallows. Steeped in history, the area is also the ancestral home of Clan Cameron. 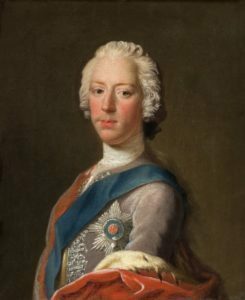 And legend has it that a consignment of gold sent from France to help fund the escape of Bonnie Prince Charlie, pictured, is hidden in the forest. 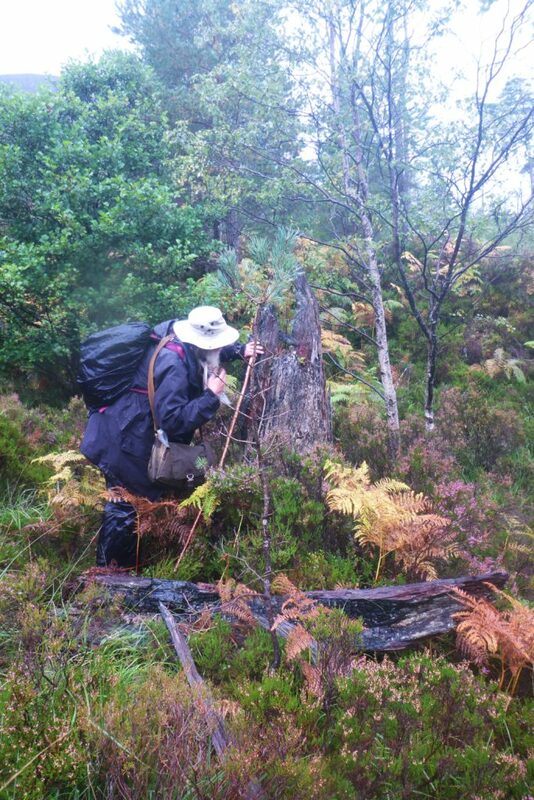 Brian Coppins surveys one of the incinerated trees for the rare fire lichen. Photograph: Andy Acton.